The SKiiP technology introduced by SEMIKRON in 1992 is a special pressure contact technology with advantages in power density, longevity, reliability and cost. The most important feature is the design without a baseplate. The DCB substrate with the chips is pressed onto the heatsink either by pressure moulds in the housing or with structured pressure elements between the chips. The main advantage of this construction technology is that no adhesion bond connection such as a large soldering area exists between the DCB substrate (thermal expansion coefficient of 4...7·10-6/K), and the Cu baseplate (thermal expansion coefficient of approximately 17.5·10-6/K). This avoids lifetime-related mechanical stresses between baseplate and DCB, as they occur in conventional modules with temperature changes. Due to the absence of the baseplate and the lower solder layer, the thermal resistance between the chips and the heatsink decreases. Thus a higher power density can be achieved in the steady state operation compared to the baseplate modules. The elimination of the thermo-mechanical stress between the baseplate and ceramic substrates allows the use of very large substrates for modules without baseplate. This is instead of several small substrates soldered to a common base and connected by additional elements. The SKiiP technology is used by SEMIKRON in various product groups and combined with different power and control terminals contacted within the module. 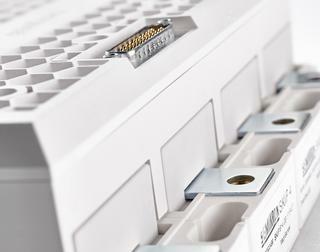 Within the modules (SKiiP4, SKiM63/93), the load terminals are designed as a low-inductance sandwich busbar. A finger structure of the busbars acts both as a symmetrical electrical contact to the individual IGBT and diode chips as well as a uniform distribution of mechanical pressure of the DCB substrates to the heatsink. 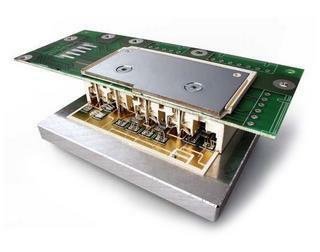 In contrast, the "SPRiNG" system of the MiniSKiiP products is adapted to the use of printed circuit boards. The pressure of the DCB substrates to the heatsink is largely provided by springs which, at the same time, provide the electrical contacts to the PCB, see Figure 3. The planar level of the PCB above the contacts is ensured by a rigid "lid". The necessary contact pressure between the lid and the cooling device is achieved by tightening the mounting screws.